Goal: Change the Domain Name of a WordPress site. Resources: 5 minutes of your time + 1 wetopi server running your WordPress site. Let’s go to the detail page of the site we want to change. From this Wetopi page, we will manage the Domain Name. There is no need to touch our WordPress admin configs or update obscure records in our database, Wetopi will do all this for us. 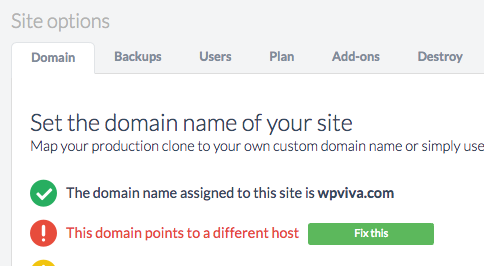 In this step by step, we are renaming from a default subdomain: wp-viva.a.wetopi.com to a newdomain.com of our own. So let’s tell Wetopi “I have my own domain”. Once Saved, It’s time to “Promote” our wetopi clone to let him use this new “Production” domain. That’s the action called, “Promote to production”. 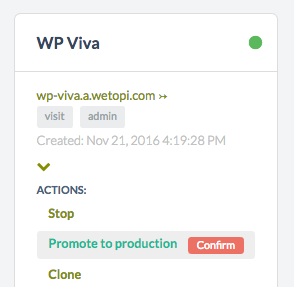 Promote to production button will change the Domain Name of my WordPress site. During this action, wetopi will configure the WordPress site with the new domain and then it will rewrite the URLs of all posts, media, links, etc. affected by this domain change. 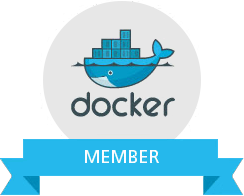 This action will take a few seconds (something between 5 and 15 seconds, depending on the site size). Wait! One more step. We have to modify our domain DNS. 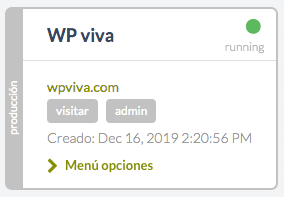 Our WordPress clone is ready to accept traffic on its new wpviva.com but we must tell the World where to go to find our WordPress site named “wpviva.com”. It’s time to change the DNS. This is the most difficult obscure step! Once you’ve set your name servers, you’re done. Yes, you read that right. That’s all there is to it. You’ll have to wait a bit, though, before you can access your website using your new domain name. Just because you set it at your registrar level doesn’t mean that the rest of the Internet knows your domain has a new address. It takes a while, sometimes up to 2 or more days for every machine in the world to catch up with the changes.